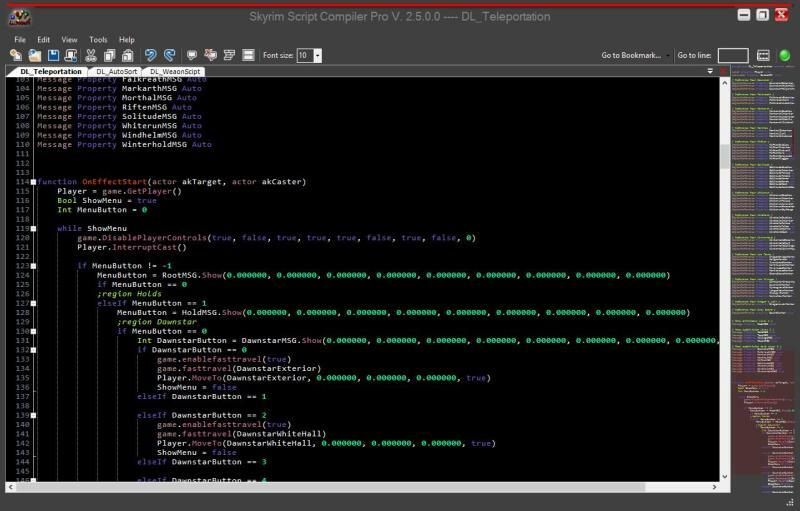 Skyrim Script Editor is a tool to replace the Creation Kit's default script editor. It provides the same functionality, as well as dozens of other features - some the same as other script editors, like Sublime Papyrus, and many unique to SSE. (You may find a list of all the included features below.) SSE is my way of giving back to the wonderful modding community. This is a tool strictly for Skyrim modders, not mod users. If you don't understand it or the code being used, then this tool is not for you. It is used for the practice of Skyrim scripting. A decompiler. It's not something I am interested in creating, nor something that I support. If you want one, you can find one elsewhere, but I will not be including it in SSE. It's currently very complete and functional. You can use it for all your scripting needs. I've implemented the features I most wanted to at the beginning of this project, like Auto-Complete and Syntax Highlighting. However, I'm constantly looking for new suggestions to make this utility better, so please comment if you have any ideas. And, of course, I'll continue squashing any bugs I find. If you find anything that may be a bug, please report it as well so I can get to it as soon as possible. - Filter for opening script with options of "Starts with" and "Contains"